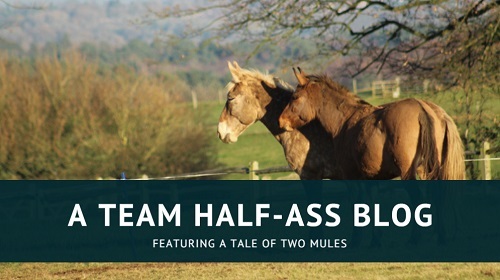 Horses hold something of a monopoly when it comes to films about animals, but I was pleasantly surprised to discover that there are a few mule movies to be found as well! However, I have a confession to make: I haven’t actually watched any of the feature-length films on this list. I certainly meant to, but I can’t remember when I last had the time to sit down and watch an entire film! Between that and the fact that none of these are on Netflix yet, I knew it was going to be a very long time before I could share these trailers with you if I intended to review them first. So instead, I present them to you unseen. I hope they are worth sharing – for the laughs, if nothing else! Has anyone watched Racing Stripes? 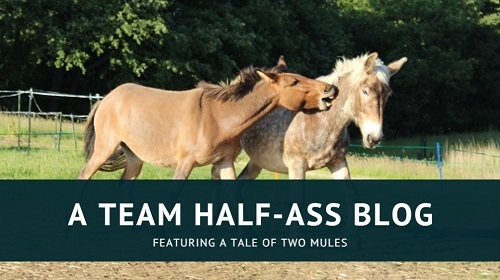 I’m imagining that this is the mule version of that illustrious movie. Released in 2009 and starring the voice of rapper Ice-T as the eponymous longears, Tommy and the Cool Mule is a story about a young boy who discovers a talking mule and must win a race in order to stop his family ranch being bought by villainous Kevin Sorbo. You know – the usual deal. Three years later, Kevin Sorbo makes another appearance in a mule movie, this time as the protagonist’s bachelor uncle. After her dad goes to jail, spoilt Dani must give up her show horses and move in with Uncle Kevin Sorbo who is not at all nefarious in this film. In fact, he gives her a mule colt who she raises and “learns what really counts”. There’s also a pretty boy crush and, I’m assuming, probably some kind of show to be won, which is why I haven’t tried very hard to watch this particular film … as tempting as the mule portion of it is, I fear it may be a little too twee for me. 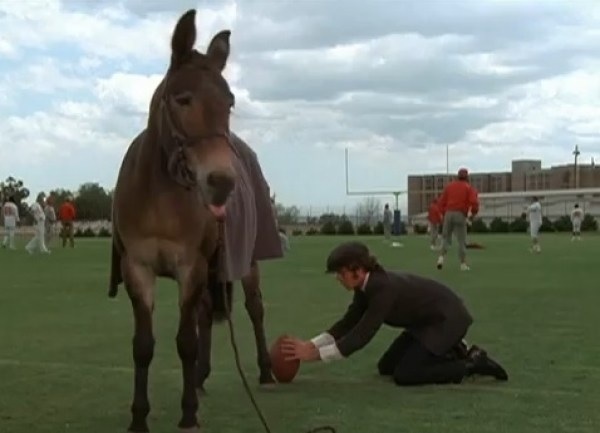 Going back to 1976 now, and the Disney film Gus which blends mules and American football in an underdog comedy. After being promoted from team mascot to actual player, Gus the mule helps his hapless team start winning and move up the rankings. There’s no Kevin Sorbo, which is a disappointment. Embedding has been disabled on the only YouTube trailer I can find, but you can watch a short clip here. There are a lot of Francis films – I’m just sharing the trailer for the first one, released in 1950. Francis is an army mule, who repeatedly gets honest soldier Stirling into several ridiculous situations thanks to Francis’ smarts and Stirling’s inability to lie about the source of his information. Kevin Sorbo had the bad manners to not even be born until two years after the final Francis film, so he’s definitely not in this one. As a bit of trivia: Francis himself began life in short stories where he refused to leave the long-suffering author alone and firmly planted himself as protagonist rather than the minor character he’d been intended to be; he also featured in several comic books. He was chatting long before Mr Ed, and the ‘speech’ training techniques they’d developed with Francis were applied to Mr Ed. Oki … the mule only makes a very, very brief appearance in this 2012 Tibetian film, but I figured I’d include it because it’s just 20 minutes long and is a funny and charming story filmed on a very tiny budget, which I appreciate. Lodro the monk goes in search of Manjushri, the embodiment of wisdom, and encounters some intriguing characters along the way. Unfortunately, none of these characters are Kevin Sorbo. This animated short, heavily influenced by Spirit: Stallion of the Cimarron, tells the story about a mule born on a Gypsy Vanner farm who feels lonely and longs for a baby of her own. 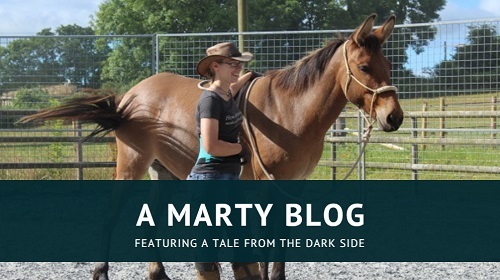 It’s got songs, majestic horses, talking animals, a mad scientist – what more could you want? Oh yeh, that’s right. There’s no Kevin Sorbo. In keeping with the animated theme, Jasper the Mule is an animated series that follows the adventures of … well, Jasper the mule. Not technically a film or even a short, but I figured I’d include it on the list. However, even though this award-winning series was designed by Meredith Hodges herself, there’s still no Kevin Sorbo! It’s like he’s not even trying. Maybe he got burned out after doing Cool Mule and Storm Rider. Maybe this joke isn’t funny anymore.